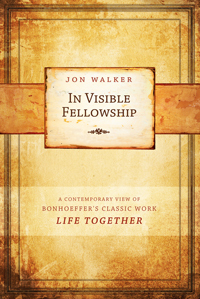 In Visible Fellowship engages Bonhoeffer’s classic work on Christian life in community, Life Together, presenting its rich and vital themes for Christians in the twenty-first century. Christians were never meant to live life alone. Only ”in visible fellowship” do we learn to love one another and to live like Jesus is real. Can you go it alone in this world and live out the Christian mission and life? Can you possibly live out the full life Christ promised with all of its power and wonder without the love of the family of God? In his first book on Bonhoeffer’s writings, Costly Grace, Jon Walker gave a contemporary view of The Cost of Discipleship. In this second book, focusing on Bonheoffer’s follow-up book, Life Together, Walker searches deeply into Bonheoffer’s classic work to bring us a contemporary view of life in the body of Christ. In our individualistic culture, Christians learn how to live in communities of love. God is relentless in his command to ”love each other in the same way that I have loved you”–personal and up-close, meeting the needs of the undeserving, not attacking their faults. Walker brings a clear voice and powerful teaching to Bonheoffer’s classic work on the church enabling you to understand the great importance of the Body of Christ. Through life together we grow into authentic spiritual maturity. As we live out the life of faith together, the love, forgiveness, and power of Christ literally and visibly comes alive for the world.